Corn Exchange Street was previously known as Slaughterhouse Lane. To the east of the lane was the Beast Market and a slaughter yard. 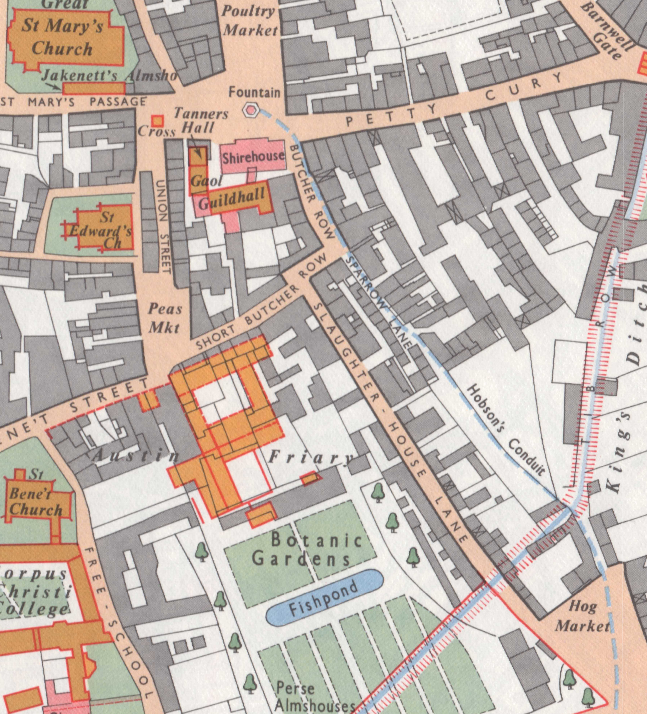 The map published by he Historic Towns Trust of Cambridge in 1800 shows Slaughterhouse Lane and Union Street on the west side of the modern Guildhall site. 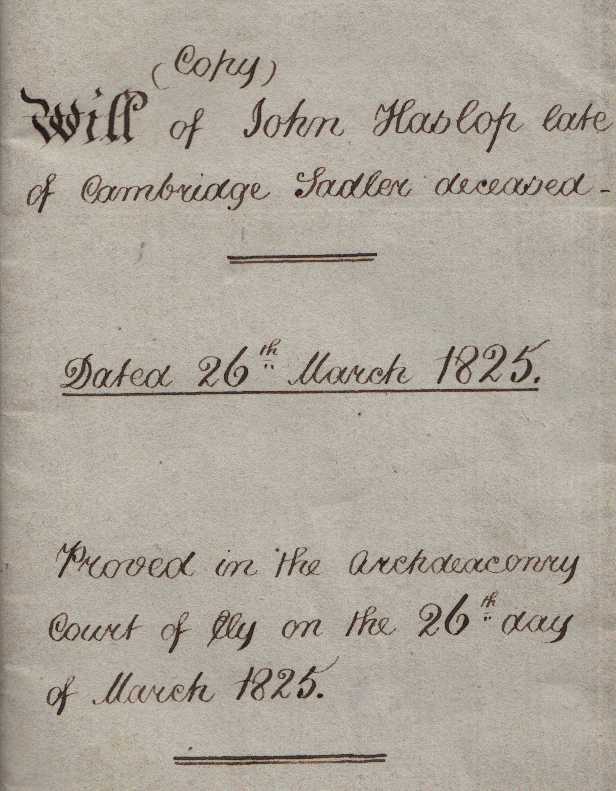 The documents in the possession of the firm of Rattee and Kett concerning this site start with the last will and testament of of John Haslop, a sadler and harness maker, dated 26th March 1825. 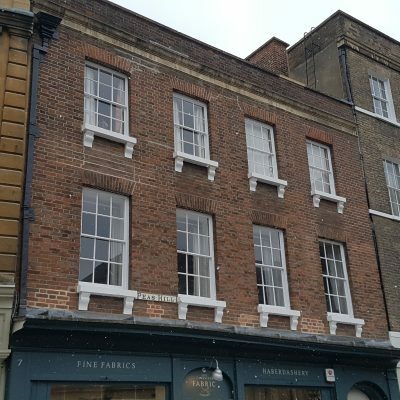 Although the will makes it clear that John wishes his saddle making business carried on after his death, there is recognition that his wife Martha and son Peter also run a butcher’s business. 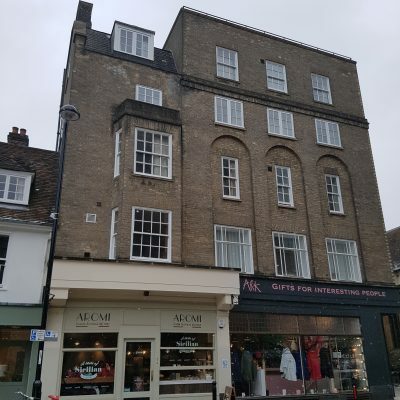 The property that he leaves to his wife lists: the house and premises lately purchased of Daniel Shuttleworth in Benet Street, the slaughterhouse in Slaughterhouse Lane and the butcher’s shop on Market Hill. He directs that after Martha’s death, the slaughterhouse shall become the property of his son Peter. 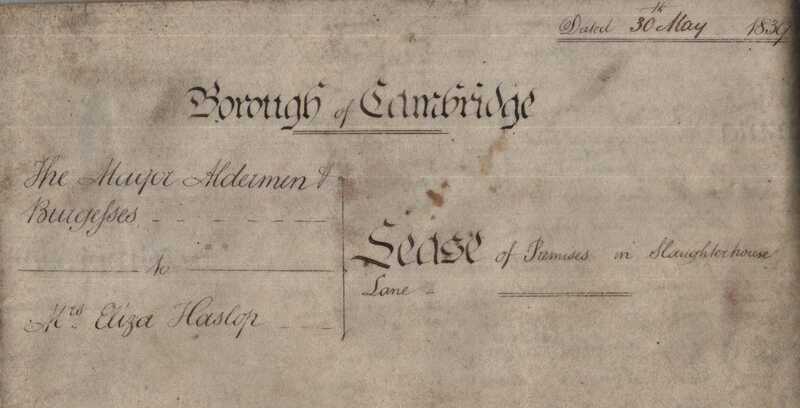 The indenture dated 30th May 1839 between the Borough of Cambridge and Eliza Haslop, widow of Peter Haslop, butcher, concerns the property which had been let originally to John Willimott in 1821 but control of which had passed to Eliza Haslop. At some point the property has been converted into a slaughterhouse with yard, stable and outhouses. 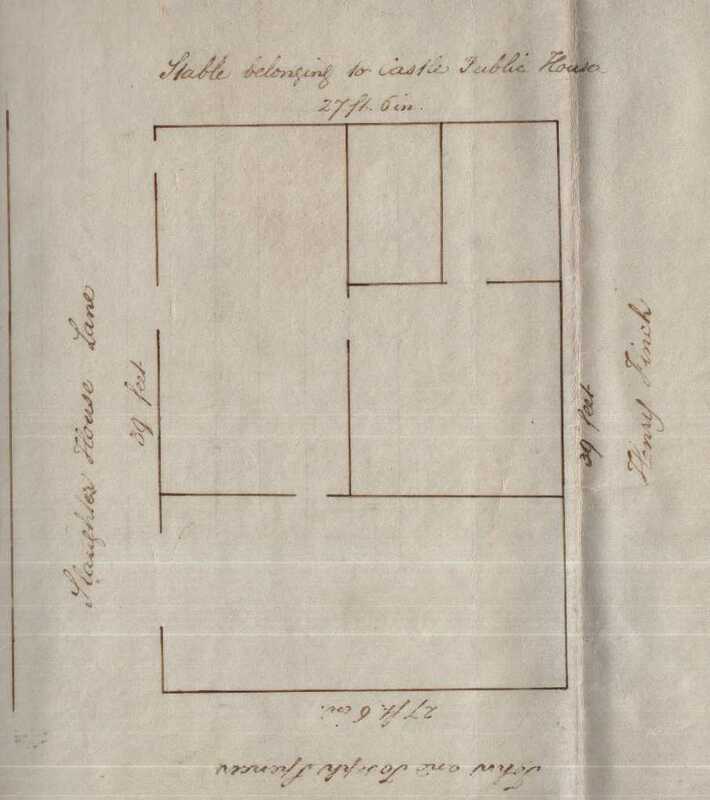 The identure contains a plan of the property. 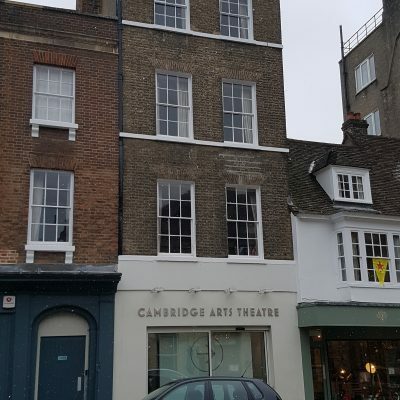 It is on the east side of Slaughterhouse Lane with the stable belonging to the Castle Inn bordering on the north side. 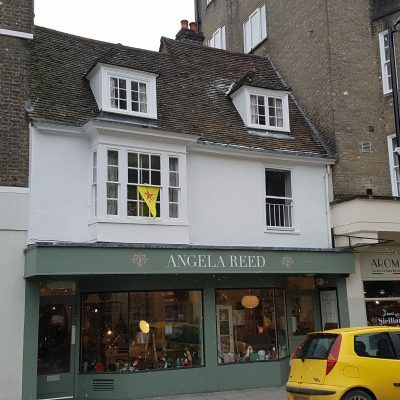 The lease is for 40 years and the annual rent is £2 2s plus 2s 6d administrative charge to the Borough Treasurer. 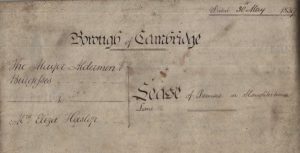 However, Eliza still pays £85 for this agreement. 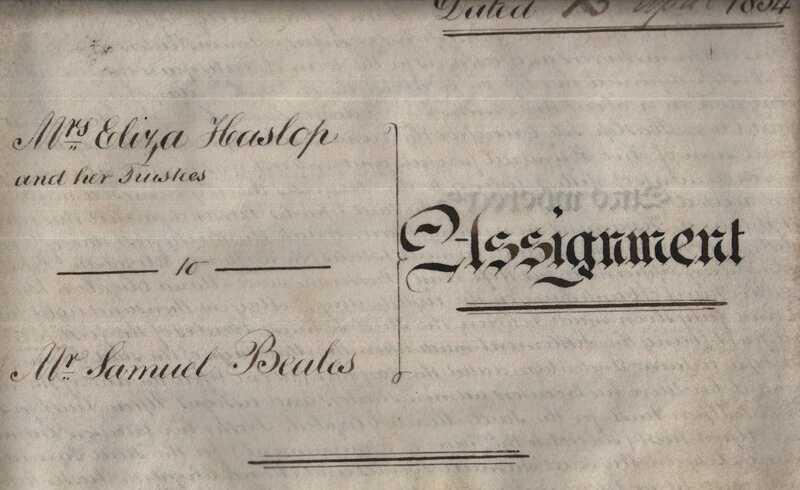 In 1841 Eliza Haslop is listed in the census as a butcher living in Union Street. She is likely to be the same Eliza Haslop as was christened in 1811 in St Bene’t’s Church. 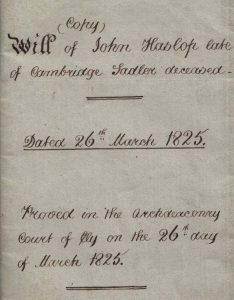 She is living with five children, Eliza 10, Ann 8, Alice 6, Sarah 5, Peter 3, as well as Hannah Bailiff 35, Mary Saville 20 and Sarah Canham 20. 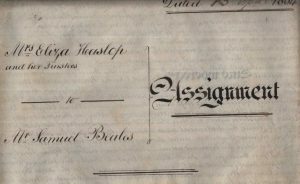 In 1854 Eliza Haslop sold the lease to Maria Elizabeth Beales. 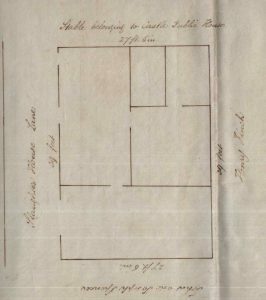 In 1851 she is married to Samuel Beales, 28, a farmer from Ickleton with 112 acres; in 1861 she is still married to him and he has 249 acres. 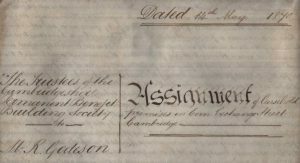 An 1870 indenture records further changes of control over the property leading to this agreement with Richard Godeson. 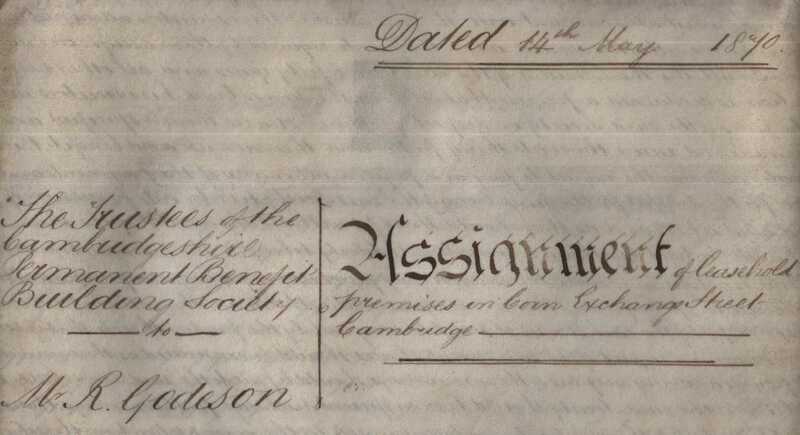 Richard Godeson does not appear in the 1871 census but in 1861 he was a whitesmith living at 11 Victoria Street.